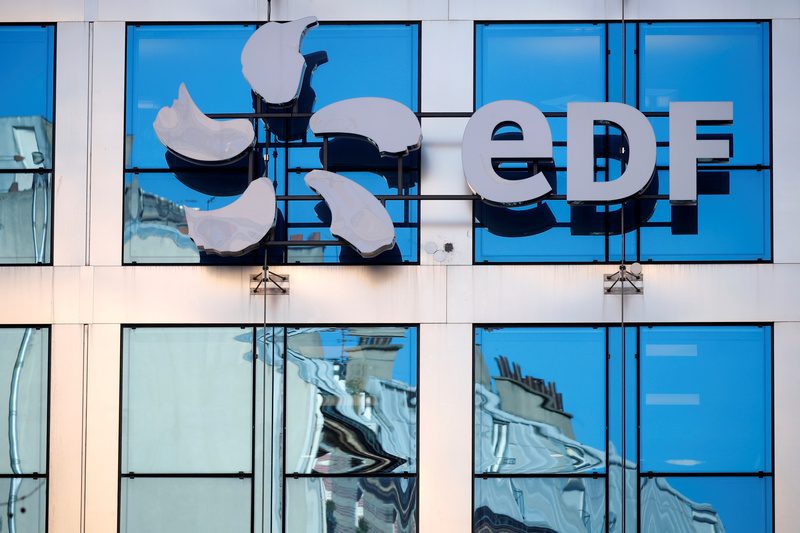 The logo of EDF (Electricite de France) is seen on the French state-controlled utility EDF's headquarters in Paris, France, February 15, 2019. Swiss investors EOS Holding and Primeo Energie are jointly buying French group EDF's 25 percent stake in utility Alpiq Holding for 489 million Swiss francs ($489 million), or 70 Swiss francs per share, the companies said on April 5. The move by the two shareholders aims to consolidate control of Alpiq in Swiss hands and eventually take the power supplier private, the companies said. Alpiq shares gained more than 11 percent in early trading and were up 9.4 percent at 71.3 Swiss francs by 1000 GMT on April 5. EDF shares rose 1 percent to 12.1 euros.